If you're looking for a great (and cheap!) hotel in Cancun, CheapTickets is the best place to find them. We offer deals on the best 373 hotels throughout Cancun. No matter what you're looking for, we have options for you. 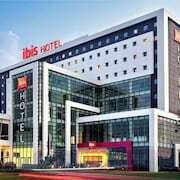 Grab great rates on the 159 affordable 3-star hotels that are easy on the wallet without sacrificing comfort. Looking for more luxury? 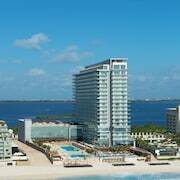 Try one of the 55, 4-star hotel accommodations in Cancun. No matter your budget needs, we've pulled out all the stops to make sure you have plenty of vacation options. Maybe you prefer to search for your hotel deals based on what each hotel offers? For example, let's say you just want to find a hotel or resort that has a pool to cool off in after a long day exploring Cancun. Scroll down to choose from the 154 hotels in Cancun that has a pool for guests. Or search for deals on Cancun hotels offering free wifi or breakfast, non-smoking rooms, and more! CheapTickets is here to be your personal travel agent for your next trip to Cancun. Get booking today! What hotels in Cancun offer free wifi access? Are there deals on Cancun hotels offering free breakfast? Yes! The only thing better than finding a great deal on a cheap hotel in Cancun is finding one that offers free breakfast. Grab some eggs, a waffle, or some healthy oatmeal before a day full of exploring Cancun and all that it has to offer. Below are just some of the many hotels that offer free breakfast in Cancun. GR Solaris Cancun & Spa - All Inclusive is a 4.00 star rated hotel property in Cancun that offers free breakfast. 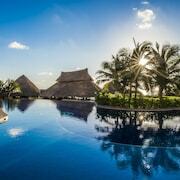 Hyatt Zilara Cancun - Adults Only - All Inclusive is a 4.50 star rated hotel property in Cancun that offers free breakfast. 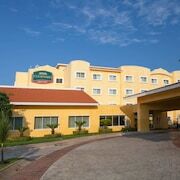 The Royal Islander - An All Suites Resort is a 3.50 star rated hotel property in Cancun that offers free breakfast. Oasis Palm All Inclusive is a 3.50 star rated hotel property in Cancun that offers free breakfast. What about deals on pet-friendly hotels in Cancun? Cancun is a great place to get outside and explore with your pets in tow so don't leave your furry friends behind. Below you'll find great deals on hotels in Cancun that allow pets. Don't forget to bring plenty of treats! Gran Caribe Resort All Inclusive - Rebranded as PANAMA JACK is a popular, pet-friendly, 4.00 star hotel in Cancun. Fiesta Americana Condesa Cancun All Inclusive is a popular, pet-friendly, 4.00 star hotel in Cancun. Royal Solaris Cancun Resort Marina & Spa - All Inclusive is a popular, pet-friendly, 3.50 star hotel in Cancun. 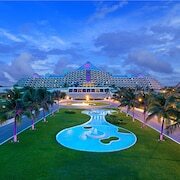 Moon Palace Cancún - All Inclusive is a popular, pet-friendly, 4.50 star hotel in Cancun. Any good rates on Cancun hotels with restaurants? Absolutely. Don't want to deal with planning our all your meals on your trip to Cancun? We don't blame you. Keep the hangry away by staying in one of the 141 hotels that have restaurants. With a room at one of these spots, all it takes to get a good meal is hopping in the elevator. Check out some of the most popular hotels in Cancun that have restaurants below. 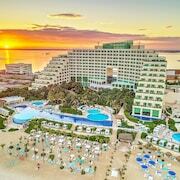 Book All Ritmo Cancun Resort & Water Park - All InclusiveAll Ritmo Cancun Resort & Water Park - All Inclusive is a 3.50 star hotel and has one or more restaurant options. Book Ixchel Beach HotelIxchel Beach Hotel is a 3.50 star hotel and has one or more restaurant options. Book Dreams Sands Cancun Resort & Spa - All InclusiveDreams Sands Cancun Resort & Spa - All Inclusive is a 4.00 star hotel and has one or more restaurant options. Book GR Caribe By Solaris Deluxe All Inclusive ResortGR Caribe By Solaris Deluxe All Inclusive Resort is a 4.00 star hotel and has one or more restaurant options. What are the cheapest hotels in Cancun with pools? What's better after a long day exploring Cancun then a relaxing dip in a pool? Finding the Cancun hotel you need for a bargain! Cool off and unwind at one of our 154 Cancun hotels with a pool. Browse some of the top deals on these hotels and resorts with pools in Cancun below, but be warned: You may not want to check out! 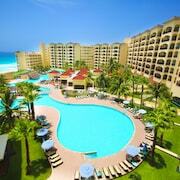 Sandos Cancun Lifestyle Resort All Inclusive has a pool and a 4.00 star rating. 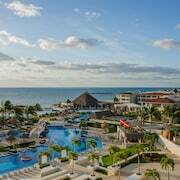 Grand Park Royal Cancun Caribe All Inclusive has a pool and a 4.00 star rating. Grand Oasis Cancun All Inclusive has a pool and a 3.50 star rating. Riu Cancun All Inclusive has a pool and a 3.50 star rating. What hotels in Cancun offer parking for guests? Once you've made your way to Cancun, the last thing you want to deal with is finding parking close to your hotel. Avoid the hassle of parking around the block and carrying your luggage all the way to the lobby by booking one of our hotels with parking. Check out deals on some of the 161 hotels in Cancun that offer parking for guests. Seadust Cancun Family Resort - All Inclusive This hotel has a 3.50-star rating. Krystal Cancun This hotel has a 3.50-star rating. Iberostar Cancun All Inclusive This hotel has a 4.00-star rating. 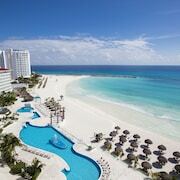 Dreams Sands Cancun Resort & Spa - All Inclusive This hotel has a 4.00-star rating. Do Cancun hotels offer 24-hour concierge services? When you're on vacation, things don't always go according to plan. Travel with peace of mind when you book one of our 101 hotels in Cancun with 24-hour concierge service. That way you know help is always phone call or elevator ride away. Try Grand Oasis Sens - Adults Only - All Inclusive. It's a 3.50 star rated hotel in Cancun that offers concierge services 24 hours a day. Try Marriott Cancun Resort. It's a 4.50 star rated hotel in Cancun that offers concierge services 24 hours a day. Try Occidental Costa Cancún All Inclusive. It's a 3.50 star rated hotel in Cancun that offers concierge services 24 hours a day. Try The Westin Resort & Spa Cancun. It's a 4.00 star rated hotel in Cancun that offers concierge services 24 hours a day. What about low rates on non-smoking hotels in Cancun? Occidental Tucancún All Inclusive This hotel has a 3.50-star rating. Riu Cancun All Inclusive This hotel has a 3.50-star rating. Hard Rock Hotel Cancun All Inclusive This hotel has a 4.50-star rating. 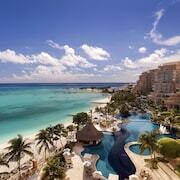 Crown Paradise Club Cancun All Inclusive This hotel has a 3.50-star rating. What are the cheapest Cancun 3-star hotel deals? Our 3-star hotels bring you quality accommodations at a lower price point for the perfect, budget-friendly vacation in Cancun. With 159 3-star hotels throughout Cancun to choose from, you still have options. Browse our selection below. Grand Oasis Cancun All Inclusive. Grand Oasis Cancun All Inclusive puts guests a 10-minute drive from the Mayan ruins at El Rey. The sailboarding and parasailing at Playa Marlin are only a 12-minute drive away, while the horseback riding at Tres Rios eco-park is a 45-minute drive. For local shopping, Plaza Outlet is 20 minutes away. Grand Oasis Sens - Adults Only - All Inclusive. Grand Oasis Sens - Adults Only - All Inclusive resort sits on a white-sand beach in the Cancún Hotel Zone; the international airport is 14.5 km (9 miles) away. Occidental Costa Cancún All Inclusive. This Mediterranean-village-style resort lies on a calm-water beach between Cancún's downtown and the nightlife district near the convention center--each 3 miles away. The airport is within 5 miles. What are the best deals on 4-Star Hotels in Cancun? Cancun is full of hotels and it can be hard to narrow down where you really want to stay. Luckily, we've done that hard work for you be narrowing you from 373 hotels throughout Cancun, to the 55 4-star hotels in Cancun. Our 4-star hotels in Cancun are exactly what you need for your next family trip, romantic weekend, or solo getaway. Check out our most popular deals below. GR Solaris Cancun & Spa - All Inclusive: Nestled on the beach, this Hotel Zone resort is within a 10-minute walk of El Rey Ruins and Playa Delfines. Playa Ballenas and Aquaworld are also within 3 mi (5 km). Hyatt Ziva Cancun All Inclusive: Nestled on the beach, this Hotel Zone resort is 0 mi (0 km) from Delphinus Dreams and 2.4 mi (3.8 km) from La Isla Shopping Mall. Playa Gaviota Azul and Forum Beach are also within 10 minutes. Riu Palace Las Americas All Inclusive - Adults Only: A slice of Spain on the Caribbean is on display at Riu Palace Las Americas, in the heart of the hotel zone and near shops and night clubs. This beachside resort is 8.5 km (less than 6 mi) from downtown Cancún. Riu Palace Peninsula All Inclusive: The Riu Palace Peninsula All Inclusive resort stands right on a private white-sand beach lapped by turquoise water. Ferries to Isla Mujeres leave from a terminal a 12-minute drive away, and souvenirs are on offer just across the street at Plaza Caracol shopping mall. What are the best activities to do in Cancun? Latter Day Saints - Ek Balam: Starting at just $135 per person. Chichén Itzá Mayan Ruins Day Trip: Starting at just $89 per person. Jungle Speedboat & Snorkel Tour: Starting at just $69 per person. Captain Hook Dinner Adventure: Starting at just $80 per person. Amazing customer service at this hotel loved our stay everything was perfect. We have been guests of the Royal Resorts almost every year since 1992 and have never been disappointed with the terrific value of vacationing in their many properties. This is the first time we've been guests at the Royal Caribbean since it changed from being a time share property, but their did not seem to be any difference in the product provided. I don't see how they could do better. Very good service and Very good customer service.and good location. Food was great. Service was wonderful. Rooms were clean.